BNP Paribas Real Estate aims to further its expertise in managing and processing of real estate data by forming a Data & Analytics department, under the supervision of Christophe Pineau in his new appointment as Chief Data & Analytics Officer. In doing so, the company intends to meet the challenges of Big Data, Smart Data, and Data Science. BNP Paribas Real Estate has created this department as part of its innovation and digital transformation strategy. Its objectives will be to collect all data available and to analyse activities related to the real estate sector in as much detail as possible in order to offer new services to the company’s clients. “It is obvious that processing real estate data is a real boost for performance. The creation of the Data & Analytics department will increase the efficiency of data management processes within BNP Paribas Real Estate, indisputably setting it apart in the industry, allowing to meet the growing needs of the clients of each of its business lines in data processing, quality, visualisation, and analysis”, commented Pascal Maury, Deputy Managing Director, Human Resources, Strategy & Innovation. Christophe Pineau will draw upon his sixteen years of experience in BNP Paribas Real Estate’s research department, including six years as Global Head of Research, to lead this department. Reporting directly to Pascal Maury, Deputy Managing Director, Human Resources, Strategy & Innovation, Christophe Pineau will build on his extensive knowledge of company information, his data analysis skills, and his successes in project management. Christophe Pineau, 48, is a graduate of Institut d’Etudes Politiques de Grenoble and holds a doctorate in economics from Université de Poitiers. He began his career in 2000 as an economist at Rexecode. He joined the research department at BNP Paribas Real Estate Transaction France in 2001, where he became Deputy Director in 2003 then Director in 2005. In 2008, he was appointed Director of France and International Transaction Research at BNP Paribas Real Estate. 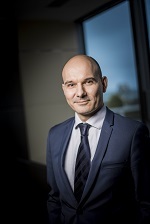 In 2010, Christophe Pineau became Global Head of Research, serving BNP Paribas Real Estate’s six business lines with a team of more than 50 people covering Europe.